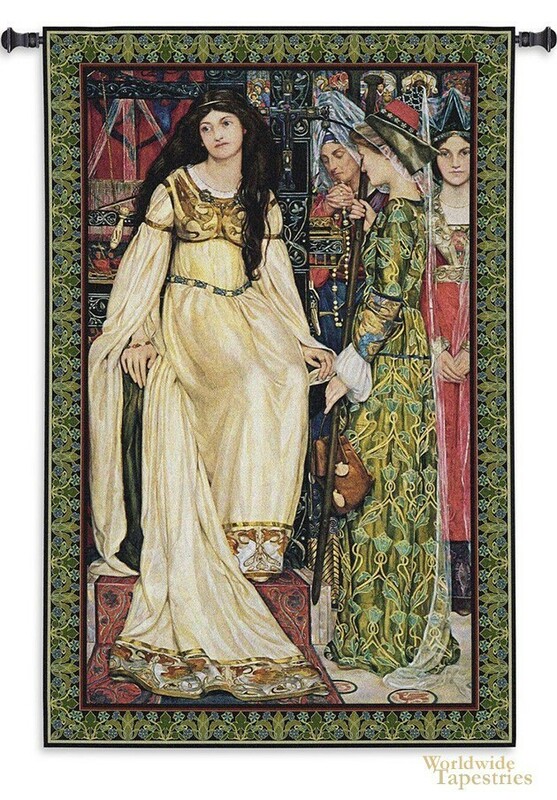 The Keepsake tapestry shows the work of artist Kate Bunce (1856-1927). An English painter and poet of the Arts and Crafts movement in England, this work received the Picture of the Year award in 1900. Here in this Keepsake tapestry we see a scene of the story of the Staff and the Scrip by Dante Gabriel Rosetti. In this story a pilgrim falls in love with Queen Blanchelys and vows to defeat Duke Luke who is oppressing her people. The pilgrim is killed in battle, and the staff and scrip, are kept by the Queen as a keepsake. Here we see the Queen in her cream robes and long black hair, with her court women and men in a variety of colorful garments and head gear, handing her the staff and scrip. This is a work which celebrates the Pre-Raphaelic style of art with a theme of 18th century stories. The Keepsake tapestry is backed with lining and tunnel for easy hanging. Note: tapestry rod and tassels, where pictured, are not included in the price. Dimensions: W 53" x H 82"